Cable hit daily low at 1.2870 in early American session on Wednesday, on fresh weakness from daily high at 1.2958, hit after sizeable buy order was triggered minutes before noon fix. 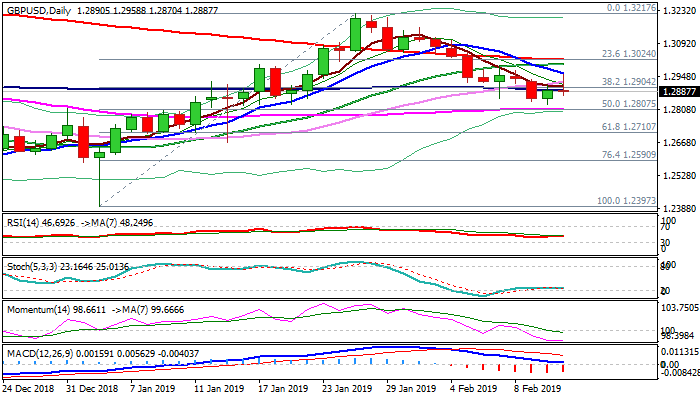 Sterling returned to bearish mode after UK inflation dropped below 2% and hit lowest level in two years (Jan CPI y/y 1.8% vs 1.9% f/c and 2.1% prev), although immediate reaction wasn't as strong as anticipated, as the situation remains overshadowed by developments around Brexit. The pair remains highly volatile, as expected, with bearishly aligned near-term picture as long as the price is unable to clearly break above 100SMA (1.2889). Daily techs are in negative setup and support the notion. Bearish scenario would include attack at 1.2807 Fibo support/55SMA, violation of which would risk extension towards 1.2710 (Fibo 61.8% of 1.2397/1.3217). Conversely, close above 100SMA would sideline bears, however, further recovery would face tough barriers at 1.2961 (10SMA); 1.2999 (20SMA) and 1.3020 (200SMA) break of which would provide stronger bullish signal.